In 2011, the International Association for K-12 Online Learning released the second iteration of the National Standards for Quality Online Courses. These standards have been used by numerous institutions and states around the country to help design and create K-12 online courses. However, there has been no reported research on the validity of the standards or the accompanying rubric. This study compares all elements under the five main standards to contemporary K-12 or higher education online course literature. The research concludes with suggested changes and additions, as well as an explanation as to how the research connects to a larger study on K-12 online course design. Adelstein, D. & Barbour, M. (2016). 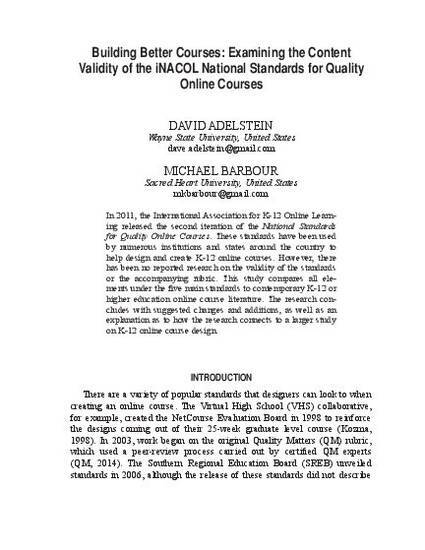 Building Better Courses: Examining the Construct Validity of the iNACOL National Standards for Quality Online Courses. Journal of Online Learning Research, 2(1), 41-73. Association for the Advancement of Computing in Education (AACE).